The last week has seen a slow creep towards Autumn in Umbria. Heavier blankets have come down out of the attics, and on the Steps of the cathedral (ever the focal point of Perugia’s social life) t-shirts and shorts have been replaced by long sleeves and jeans. It’s hardly dramatic, as Umbria’s sun never goes behind clouds for too long, even in the depths of winter, and to boot Fall in Umbria means gastronomic treats. Fairly soon farmers will head out with their green nylon nets to harvest olives: the first press in Umbria is almost always extra-virgin level, attacks your palate and makes the olive oil of last year seem drab. 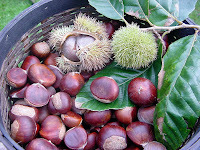 Then, in early November, central Italians celebrate San Martino, Saint Martin’s feast day: vino novello and roasted chestnuts are the main event. No more ice cream, but there are some consolation prizes. Buon autunno!